She blew through his perfect world like a gale force wind. He took her heart by storm. Dropping everything and leaving her idiot boyfriend behind, Carly Fuller heads to the country to start her life anew, never expecting the dolt to turn possessive and follow her. On the run and in fear for her life, she turns down a long blacktop drive with beautiful black-board fencing. Hoping the wealthy, respectable owners will help her get to the authorities, she finds that the gorgeous horse farm belongs to one hunky carpenter who has more than enough muscle to safeguard her. While his childhood friends have eagerly left the country, Jeremiah Kessler remains as far away as possible from the busy city life. 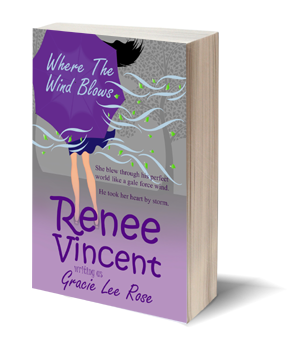 Content to live in the quiet, rolling hills of Kentucky, his perfect world is torn asunder the day Ms. Windy City Whirlwind blows up onto his doorstep looking for sanctuary from her volatile ex-boyfriend. As every goodhearted country boy had been taught, he doesn’t turn his back on a woman in need—especially when a funneling tornado is threatening to rip through his town. As the two take shelter in his basement, Jeremiah learns that some good can actually come from the city, in particular the feisty little windstorm under his roof.